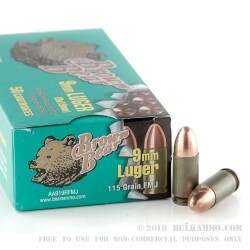 This 9mm ammo by Brown Bear is an affordable option for those of you that like to shoot in bulk. Each round consists of a 115 grain steel and copper bimetal FMJ bullet loaded into a non-reloadable berdan-primed steel case. Brown Bear uses steel cases with a lacquer coating instead of the polymer coating found on many steel cases from other manufacturers. This is newly manufactured ammo that was made in Russia at the Barnual Machine plant. Look no further than this ammo from Brown Bear before you head out for your next trip to the range! Meh. Cheap range ammo...you get what you pay for. It's cheap range ammo. That's the good news. The bad news is that it is dirty and stinky. I won't buy it again. Not worth saving a dollar or two. I'd much rather just get Winchester White Box. Too many jams. On all my mags. 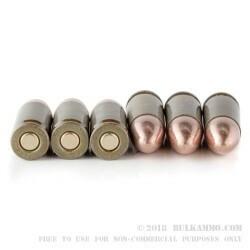 Great practice ammo with a good price! Only a few FTF but turned out it was due to the spring/firing pin which had been upgraded by my gun manufacturer on their second gen models(new spring sent for free and not a single issue after). Don't do it. 3 separate trips to the range with 100 rounds each time and 3 hard jams. Fast shipping, reliable but dirty. Will DEFINITELY Be Ordering Again! 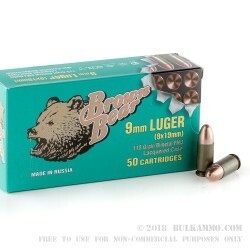 If you're looking for inexpensive, reliable ammo for your Saturday afternoon trips to the range, Brown Bear is it! Honestly, I had never heard of it before...and I was a little apprehensive when I ordered it the first time. But now that I've bought it and shot it, I not only recommend it...but I'll be ordering another 500 rounds this weekend when payday rolls around. Stock up! 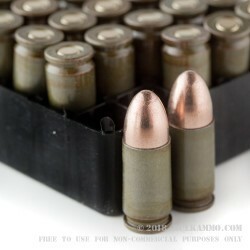 As some of the other reviews say, it is a little smoky and dirty; but what bargain ammo isn't? That's my reason for the 4-Stars on Performance. Otherwise, I would give it 5-Stars across the board. And since I'm a stickler about keeping all of my guns spit-shine clean, it's really no big deal. Just plan on spending an extra few minutes cleaning your piece at the end of the day. My wife and I ran 200 rounds through 3 different pistols, and it performed flawlessly! Not a single misfeed. Not a single misfire. Not a single jam. Not a single FTF. And we found it to be as accurate as any 9mm ammo I've ever shot. And at just over 30-cents a round, you simply can't beat it. A: I am sorry, but due to the many legal requirements we restrict our shipping to the continental US only. Q: Can these casings be reloaded? A: No, these Brown Bear 9mm cases cannot be reloaded. They're made with steel cases, which are not good for reloading. A: No - at this time, Brown Bear manufactures only FMJ 9mm ammunition. A: The biggest difference for this type of ammo is that the steel has little residual value and effectively cannot be reloaded. Steel cases also do not expand and contract like brass, so a small percentage of firearms may have issues extracting steel cases. However, the majority of modern handguns will function perfectly with steel cased ammo.